1 O God, [the] heathen have come into Thine inheritance, They have profaned Thy holy Temple, They have made Jerusalem heaps of stones. 2 They have given the corpses of Thy servants [as] meat to the fowls of the heavens, The flesh of Thy favoured Ones to the beasts of the earth. 3 They have poured out their blood like water round Jerusalem, And there was none to bury [them]. 4 We have become a reproach to our neighbours, A scoff and a scorn to those round us. 5 How long, Jehovah, wilt Thou be angry for ever? [How long] shall Thy jealousy burn like fire? 6 Pour out Thy wrath upon the heathen who know Thee not, And upon [the] kingdoms which call not upon Thy name. 7 For they have eaten up Jacob, And his pasture have they laid waste. 8 Remember not against us the iniquities of those before us, Speedily let Thy compassions [come to] meet us, For we are brought very low. 9 Help us, O God, for the sake of the glory of Thy name, And deliver us, and cover over our sins for the sake of Thy name. 10 Why should the heathen say, Where is their God? Let there be known among the heathen before our eyes The revenging of the blood of Thy servants which is poured out. 11 Let there come before Thee the groaning of the captive, According to the greatness of Thine arm preserve the sons of death. 12 And return to our neighbours sevenfold into their bosom Their reproach [with] which they have reproached Thee, O Lord. 13 And we, we the people and the flock of Thy pasture, Will thank Thee for ever; To generation after generation will we recount Thy praise. The same national agony which was the theme of Psalm lxxiv. forced the sad strains of this psalm from the singer's heart. There, the profanation of the Temple, and here, the destruction of the city, are the more prominent. There, the dishonour to God; here, the distresses of His people, are set forth. Consequently, confession of sin is more appropriate here, and prayers for pardon blend with those for deliverance. But the tone of both psalms is the same, and there are similarities of expression which favour, though they do not demand, the hypothesis that the author is the same. Such similarities are the "how long" (lxxiv. 10 and lxxix. 5); the desecration of the Temple (lxxiv. 3, 7, and lxxix. 1); the giving over to wild beasts (lxxiv. 19, and lxxix. 2); the reproach of God (lxxiv. 10, 18, 22, and lxxix. 12). The comparison of Israel to a flock is found in both psalms, but in others of the Asaph group also. The same remarks which were made as to the date of the former psalm apply in this case. Two arguments have, however, been urged against the Maccabean date. The first is that drawn from the occurrence of vv. 6, 7, in Jer. x. 25. It is contended that Jeremiah is in the habit of borrowing from earlier writers, that the verse immediately preceding that in question is quoted from Psalm vi. 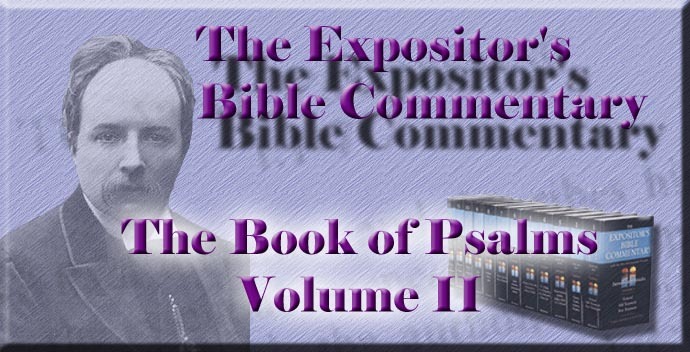 1, and that the connection of the passage in the psalm is closer than in the prophet, and, therefore, that the words are presumably in situ here, as also that the verbal alterations are such as to suggest that the prophet rather than the psalmist is the adapter. But, on the other hand, Hupfeld maintains that the connection in Jeremiah is the closer. Not much weight can be attached to that point, for neither prophet nor poet can be tied down to cool concatenation of sentences. Delitzsch claims the verbal alterations as indubitable proofs of the priority of the prophet, and maintains that "the borrower betrays himself" by changing the prophet's words into less accurate and elegant ones, and by omissions which impair "the soaring fulness of Jeremiah's expressions." The critics who hold that the psalm refers to the Chaldean invasion, and that Jeremiah has borrowed from it, have to face a formidable difficulty. The psalm must have been written after the catastrophe: the prophecy preceded it. How then can the prophet be quoting the psalm? The question has not been satisfactorily answered, nor is it likely to be. A second argument against the Maccabean date is based upon the quotation of ver. 3 in 1 Macc. vii. 16, which it introduces by the usual formula of quotation from Scripture. It is urged that a composition so recent as the psalm would be, if of Maccabean date, would not be likely to be thus referred to. But this argument confuses the date of occurrence recorded in 1 Maccabees with the date of the record; and there is no improbability in the writer of the book quoting as Scripture a psalm which had sprung from the midst of the tragedy which he narrates. The strophical division is not perfectly clear, but it is probably best to recognise three strophes of four verses each, with an appended verse of conclusion. The first spreads before God His peoples miseries. The second and third are prayer for deliverance and confession of sin; but they differ, in that the former strophe dwells mainly upon the wished-for destruction of the enemy, and the latter upon the rescue of Israel, while a subordinate diversity is that ancestral sins are confessed in the one, and those of the present generation in the other. Ver. 13 stands out of the strophe scheme as a kind of epilogue. The first strophe vividly describes the ghastly sights that wrung the psalmist's heart, and will, as he trusts, move God's to pity and help. The same thought as was expressed in Psalm lxxiv. underlies the emphatic repetition of "Thy" in this strophe--namely, the implication of God's fair name in His people's disasters. "Thine inheritance" is invaded, and "Thy holy Temple" defiled by thee "heathen." The corpses of "Thy servants" lie unburied, torn by vultures' beaks and jackals' claws. The blood of "Thy favoured Ones" saturates the ground. It was not easy to hold fast by the reality of God's special relation to a nation thus apparently deserted, but the psalmist's faith stood even such a strain, and is not dashed by a trace of doubt. Such times are the test and triumph of trust. If genuine, it will show brightest against the blackest background. The word in ver. 1 rendered "heathen" is usually translated "nations," but here evidently connotes idolatry (ver. 6). Their worship of strange gods, rather than their alien nationality, makes their invasion of God's inheritance a tragic anomaly. The psalmist remembers the prophecy of Micah (iii. 12) that Jerusalem should become heaps, and sadly repeats it as fulfilled at last. As already noticed, ver. 3 is quoted in 1 Macc. vii. 16, 17, and ver. 4 is found in Psalm xliv. 13, which is by many commentators referred to the Maccabean period. The second strophe passes to direct petition, which, as it were, gives voice to the stiffened corpses strewing the streets, and the righteous blood crying from the ground. The psalmist goes straight to the cause of calamity--the anger of God--and, in the close of the strophe, confesses the sins which had kindled it. Beneath the play of politics and the madness of Antiochus, he discerned God's hand at work. He reiterates the fundamental lesson, which prophets were never weary of teaching, that national disasters are caused by the anger of God, which is excited by national sins. That conviction is the first element in his petitions. A second is the twin conviction that the "heathen" are used by God as His instrument of chastisement, but that, when they have done their work, they are called to account for the human passion--cruelty, lust of conquest, and the like--which impelled them to it. Even as they poured out the blood of God's people, they have God's wrath poured out on them, because "they have eaten up Jacob." The same double point of view is frequently taken by the prophets: for example, in Isaiah's magnificent prophecy against "the Assyrian" (x. 5 seq. ), where the conqueror is first addressed as "the rod of Mine anger," and then his "punishment" is foretold, because, while executing God's purpose, he had been unconscious of his mission, and had been gratifying his ambition. These two convictions go very deep into "the philosophy of history." Though modified in their application to modern states and politics, they are true in substance still. The Goths who swept down on Rome, the Arabs who crushed a corrupt Christianity, the French who stormed across Europe, were God's scavengers, gathered vulture-like round carrion, but they were each responsible for their cruelty, and were punished "for the fruit of their stout hearts." The closing verse of the strophe (ver. 8) is intimately connected with the next, which we take as beginning the third strophe: but this connection does not set aside the strophical division, though it somewhat obscures it. The distinction between the similar petitions of vv. 8, 9, is sufficient to warrant our recognition of that division, even whilst acknowledging that the two parts coalesce more closely than usual. The psalmist knows that the heathen have been hurled against Israel because God is angry; and he knows that God's anger is no arbitrarily kindled flame, but one lit and fed by Israel's sins. He knows, too, that there is a fatal entail by which the iniquities of the fathers are visited on the children. Therefore, he asks first that these ancestral sins may not be "remembered," nor their consequences discharged on the children's heads. "The evil that men do lives after them," and history affords abundant instances of the accumulated consequences of ancestors' crimes lighting on descendants that had abandoned the ancient evil, and were possibly doing their best to redress it. Guilt is not transmitted, but results of wrong are; and it is one of the tragedies of history that "one soweth and another reapeth" the bitter fruit. Upon one generation may, and often does, come the blood of all the righteous men that many generations have slain (Matt. xxiii. 35). The last strophe (vv. 9-12) continues the strain begun in ver. 8, but with significant deepening into confession of the sins of the existing generation. The psalmist knows that the present disaster is no case of the fathers having eaten sour grapes and the children's teeth being set on edge, but that he and his contemporaries had repeated the fathers transgressions. The ground of his plea for cleansing and deliverance is the glory of God's name, which he emphatically puts at the end of both clauses of ver. 9. He repeats the same thought in another form in the question of ver. 10, "Why should the heathen say, Where is their God?" If Israel, sinful though it is, and therefore meriting chastisement, is destroyed, there will be a blot on God's name, and the "heathen" will take it as proof, not that Israel's God was just, but that He was too feeble or too far off to hear prayers or to send succours. It is bold faith which blends acknowledgment of sins with such a conviction of the inextricable intertwining of God's glory and the sinners' deliverance. Lowly confession is wonderfully wedded to confidence that seems almost too lofty. But the confidence is in its inmost core as lowly as the confession, for it disclaims all right to God's help, and clasps His name as its only but sufficient plea. The final strophe dwells more on the sufferings of the survivors than the earlier parts of the psalm do, and in this respect contrasts with Psalm lxxiv., which is all but entirely silent as to these. Not only does the spilt blood of dead confessors cry for vengeance, since they died for their faith, as "Thy servants," but the groans and sighs of the living who are captives, and "sons of death"--i.e., doomed to die, if unrescued by God--appeal to Him. The expressions "the groaning of the captive" and "the sons of death" occur in Psalm cii. 20, from which, if this is a composition of Maccabean date, they are here quoted. The strophe ends with recurring to the central thought of both this and the companion psalm--the reproach on God from His servants' calamities--and prays that the enemies' taunts may be paid back into their bosoms sevenfold--i.e., in fullest measure. The epilogue in ver. 13 has the image of a flock, so frequent in the Asaph psalms, suggesting tender thoughts of the shepherd's care and of his obligations. Deliverance will evoke praise, and, instead of the sad succession of sin and suffering from generation to generation, the solidarity of the nation will be more happily expressed by ringing songs, transmitted from father to son, and gathering volume as they flow from age to age.